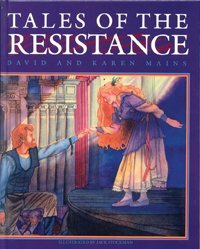 Tales of the Resistance is part of the Tales of the Kingdom Trilogy. Back in print by popular demand, this intriguing allegorical children’s classic takes place in the enchanted city where you will enjoy the wonderful experience of God’s great deliverance. I would place this treasure on an equal with The Chronicles of Narnia and Pilgrim’s Progress. "... last night I read the Orphan Exodus in Tales of the Resistance to my children and once again I was brought to tears.Ã¢â‚¬Â?